Santa has a hybrid sled and the elves have been replaced with robots. The naughty of nice list is found by scouring the Facebook for data that has been inadvertently shared. d by scouring all the data you’ve inadvertently shared over Facebook. 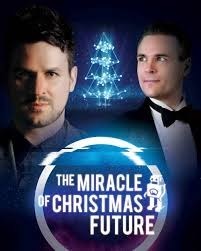 The premier of The Miracle of Christmas Future is at the Traverse Theatre, Edinburgh and runs for just four days. This is a collaboration between Scottish magician-scientist Kevin Quantum and Charlie Caper, a Swedish high-tech wizard. Sleight of hand meets state-of-the-art technology with incredible results. The phenomenal illusions give a glimpse of a world not too far from our own. There will be a magic-performing robot, science blended with showmanship, levitations, predictions, misdirection with expert showmanship from two performers at the top of their game. Suitable for all intelligent life forms aged 5+ who want to experience some festive fun!